On Friday, February 3rd, Dr. Ralph Snyderman spoke about “Taking Health Personally” at the NC CEO Forum. He introduced the concept of Personalized Health Care, the inflection curve of disease development, personalized health planning, and outlined the role of the individual in proactively managing their health and healthcare. 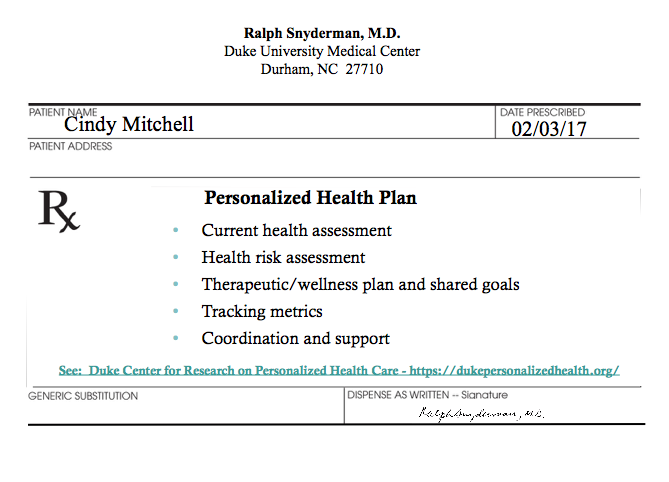 The image below is Dr. Snyderman’s “Prescription for a Personalized Health Plan”, which was featured in his presentation. Please continue to check back with this website. In the future, we hope to provide you with information to help you get started in your own personalized health planning and information for you to bring to your primary healthcare provider to enable the creation of your annual personalized health plan. If you’d like more information in the meantime, please email us at personalized-health@duke.edu.